Salsa offers solutions exclusively for nonprofits. From start-up charities, to mid-size nonprofits, to global organizations, our clients lead the industry in donor retention & acquisition. Salsa Engage multi-channel online advocacy tools will help mobilize, organize and amplify the voices of your grassroots supporters to impact policy at the federal, state, and local level. Features include online petitions, targeted messages, click to call advocacy, social advocacy, email marketing, triggered email series, and optional online/P2P fundraising tools. Salsa Engage is the online, mobile and social advocacy tool trusted by American Birds Conservancy, Toys for Tots and +3,000 more! Salsa Engage Reviews Recently Reviewed! Pros: The vast amount of robust capabilities built into the software platform, always finding new ways of accomplishing tasks and eventually easier ways of doing them. Cons: It has more of a Microsoft/tech geek feel to the GUI and application's use, rather than the Apple business model for ease-of-use right out of the box, that most non-profit volunteers/activists are accustomed to using for getting a task done quickly - the obvious metaphor to me the difference between the mechanic who wants to get under the hood of his new car and tweak and modify like a hot rod, compared to the average person who wants to drive a Honda off the lot, to get from A-to-B effortlessly and reliably without much thought because they have bigger jobs to do than figure out the mode of transporation, that the car is just a tool and you shouldn't have to take multiple mechanic classes to figure out how to drive it. Albeit, Mailchimp is a different platform for smaller email tasks for small groups, yet their ease-of-use GUI model helps the lay person get done quickly and with less confusion. Our IT personnel love the Salsa platform which is all that really needs to be said, yet the people who have to use it on a daily basis compare it to a flight cockpit of endless switches and tabs. For a premiere email database platform that Salsa is, I'm still waiting for emails I send to be fully-responsive and readable on the smallest smartphone. Just not there yet. Mentioned that at the last Salsa training event in San Francisco last fall, which we were told is coming... Still love the software platform. Even though the FAQs leave you wanting and confused with laborious hoops to jump through for answers to problems that mostly don't seem to work, sending a ticket to Salsa gets a quick, friendly response, a great answer and usually a screen capture of what precisely to do in a succinct manner, which should populate the FAQ area instead and the answer model to use. And one last thought, as with the SF training event mentioned here, and the last Salsa conference in Virginia, it was an obvious sea of Apple laptops and iPads across the board at all events, all tables. So, the clientele around DC and elsewhere, the core target demographic for your software that traveled to the conference, prefer out of-the-box, ease-of-use products to get the job done, quickly. Recommendations to other buyers: Take the time to really learn the software, specifically, task one person in your Org to learn it inside out, to then train others in a lay fashion with an easier way to understand and use it to get the job done, quickly. It has more capabilities than you could imagine or probably use, but it is a resource and workhorse that can do so much and make your organization compete for the attention of donors, volunteers, and supporters that very large global organizations are tapping into. Comments: I would recommend this solution over the other available nonprofit management enterprise solutions on the market. You get the most functionality for the money and they're constantly expanding the software's ability and support. Pros: Almost all the digital marketing tools you'll need in one platform. Social media and email marketing, custom donation forms, drip campaigns, peer to peer software, event registration and donor segmentation. These are just the pros of the marketing side. 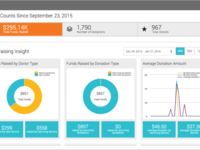 The CRM, formerly DonorPro, includes robust reporting and tracking for all your needs from donation tracking to notes to event management, volunteer management and membership management. Truly and all inclusive system that is getting better and better all the time. Cons: There have been some growing pains that have been mostly worked out in the transition to convert DonorPro into the Salsa platform. Communication between the CRM and the marketing software is still not entirely fluid, but it gets the job done effectively after you fully understand the system from training. The social media scheduling tool needs a little work to get on the hootsuite or sendible level, but again it still functions well for an all-inclusive solution for no extra money. Pros: First off, the superficial, but important fact that it looks great! It is also very simple to use. Getting our staff up a running with daily tasks, took only one or two hours of training, as opposed to weeks or months in Raiser's Edge. The templates are a great help and time saver. Even from scratch layout is super simple and intuitive. 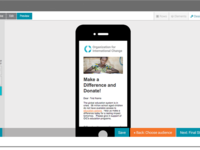 Engage offers expanded possibilities, like e-mail series, and A/B tests, and integrated donation pages, AND online advocacy! It has it all, with super built-in Analytics! Customer support, and our Success Coach, are key reasons for our success too! And, we are able to direct more resources to our projects, thanks to a real savings! Engage seamlessly integrates with the CRM which greatly simplifies data management. We still have room to grow with Engage, but are already achieving more that we ever could with Online Express. Salsa Engage beats it by miles! Cons: Transition is NEVER fun! or simple! Plan for this if you are a making ANY database change. We lost about 20 of our monthly donors. Lesson learned. Plan, Plan, Plan, And ASK every single question you have and write down every single thing you need the new program to do. And make them show you how to get it done, before you purchase. This isn't Salsa specific. General transition advice form one who now knows! That said, Salsa has done everything to help us get up and running and we are thrilled! Overall: I'd recommend Salsa Engage to anyone who wants to streamline their online outreach, especially if you have a small to mid-size organization with a small but dedicated team . And if you use Salsa CRM, it integrates so beautifully, you'll be glad you make this move. Pros: Our non-profit aids other smaller non-profit organizations in outreach and advocacy efforts around a variety of issues. Salsa has been great for us because it so flexible and capable of many different types of outreach and advocacy. It has helped us with large scale campaigns and small scale, regular communication with supporters. We are even starting to use it for donor management. 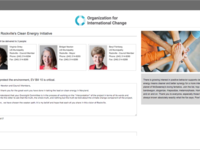 One really useful feature in Salsa is its ability to seemingly integrate into our webpage for advocacy actions, so folks can visit our page and take action without feeling like they're getting shuttled somewhere else where their contact information/identity may feel less secure. It is also fun to watch the action unfold and track response on the back end to evaluate the effectiveness of our campaign. The best part - if you run into a wall using the software, Salsa's support team is very quick to respond and amazingly helpful. Cons: Salsa, at times, can seem very complicated to use, but that is because it is such a powerful, multifaceted tool. And, like I mentioned, when it gets complicated, Salsa's support team is right there to help. One wish for the software would be that web and email templates could be a little more easy to put together, more flexible and more polished. This may speak more to my lack of design code knowledge than of Salsa Software, but I feel like my final html email products aren't as shiny as some I've produced in html email specific software. Recommendations to other buyers: I am not sure if there is access before you sign up with Salsa, but it has been very helpful to me to watch the videos and use Salsa Commons. I've learned so much of what Salsa has to offer from the videos and discussion boards in Salsa Commons. Not only have I gained a better understanding of how to use the software, but I have also gleaned a lot of tips and and outreach and advocacy ideas. Often I've found it hard to know the right questions to ask when looking for software like this, and seeing how others are using the software and maybe issues they encounter helps me to frame how Salsa can work for our database, outreach and advocacy going forward. Comments: We have been using Salsa for more than 18 months and are happy with the product. There have been numerous updates and improvements in social media sharing and other pieces since we signed on with Salsa, and we are happy with those changes. Customer support has improved dramatically since we first signed on, and I feel like we hear back with solutions to our problems, though sometimes I wish they could update incorrect legislative district information more quickly so that folks could take action when an issue is "hot." We use Salsa for advocacy actions, events, P2P fundraising, and donations and I feel like it is a very comprehensive tool to take care of all of those pieces of our work. I would recommend Salsa to organizations looking for online tools to advance their work. Two organizations. Five years. Salsa makes it easy. Pros: Simplicity of use - at least the basics - regardless of the web development skillset of the staff. The packages are also customizable for the needs of one's organization: if you need the whole kit 'n' kaboodle, you get it. If not, you get only what you need. You can also set permission levels for staff to control who can do what to which parts of the packages. Cons: The look of the forms! For orgs that can't splurge on a web developer/designer, it can be absolutely frustrating to have to clean up so many of Salsa's forms just to get them to be visually pleasing. Also, much of the common changes that orgs want to make seem to be found in some special coding: wouldn't it be easier to provide the types of forms with info most people want, but give them the option to take it off (rather than having to know and trust their coding skills to add them)? Recommendations to other buyers: TEST this with all levels of web users on the back end. If you have a small staff, it's likely that the one day you're out will be the day that an urgent, do-or-die email/advocacy campaign/donate form will need to get done. If the "monkey with a typewriter" person on your staff can easily make changes and post, then you've got truly user-friendly software. Pros: The event software allowed our small arts organization the ability to have online ticketing for events, which saved tons of staff time because they no longer need to take phone reservations. We have a better count of open to the public events also, because we ask supporters to make a no charge reservation online. The system put our e-mail communications together with all of our online communications. It is easy to use and the built in templates are simple to modify. Cons: The system works well for us and we regularly use all of the features. Our supporters like being able to access event registrations when it is convenient for them. Cons: I personally don't like trying out new software, I usually don't like the change. I didn't like the look the first time I used it, but that changed once I starting using it. Worth the price for sure. Overall: Easy to use and support team is on top of their game. They always answer my calls and respond to me quickly. They helped me create some incredible reports, these reports that make my job easier. Pros: Allows us to customize online forms for fundraising events at an affordable price. Easy to use and pull reports. Cons: I do not like the fact that the donation information flows into the system without any way to approve it. Overall: Salsa has a great training program and their customer service department is very friendly and is able to help me out when I need assistance. 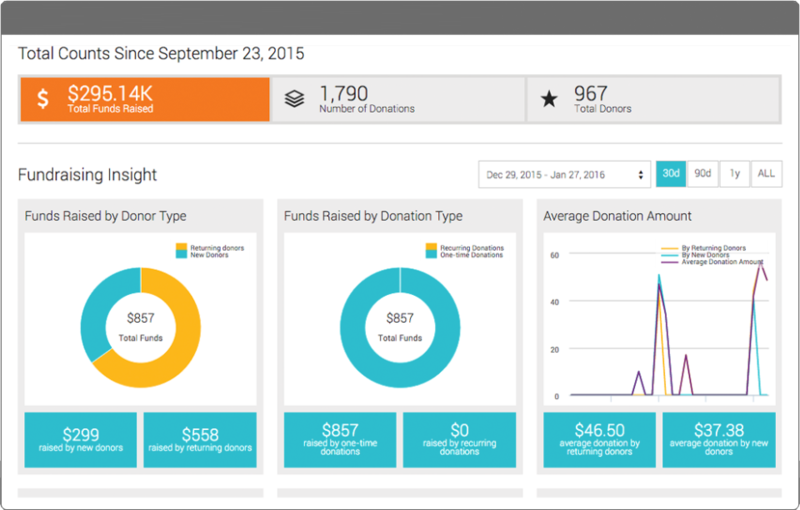 Salsa Engage allows a small nonprofit to afford customized event forms. Pros: Salsa generally has a user-friendly interface. Its a platform that be used for everything from E-blasts, to fundraising, to sign-up forms and so much more. I believe there are many told and functions that I have not had an opportunity to use. Cons: I mostly use for the e-blasts. I find the choices, formatting and other functions limited or strange. For example, the text boxes are finicky every time you make changes in one sentence it seems to make changes to entire text box, forcing you to reformat the whole box again. Also the formatting often doesn't always look great in news letters. There seems to be little room for customizing so that paragraphs and images line up properly, forcing us to put everything in a column rather than in more modern layouts. Overall: Its been ok. There are kinks that do sometimes get worked out by the company. Overall they have great customer service. So when I do have an issue, I get a quick response. Pros: Salsa provides us with most of the tools and products we need at a price affordable to small and mid-sized nonprofits. 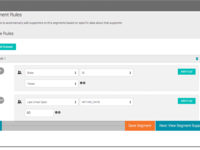 Their query and reporting tools are very robust and allow for detailed tracking of supporter actions. Cons: It is fairly challenging to customize the look and feel of the donation and signup forms, and their out-of-the-box design is fairly clunky and not super modern. It would be nice if their developers were a little more receptive to working on customizations and improvements (as one-off projects outside of the monthly fee schedule). Recommendations to other buyers: Under the hood, this tool is very robust and will serve almost all of the major needs of an advocacy organization. If you are a small operation with no web designer looking for out-of-the-box modern design, however, this may not be the tool for you. But if you have your own IT or web folks who like to tinker, this is a veritable playground. Comments: We still use this software because we're already signed on and it does what we need. However, I have been very frustrated with it for some time. Pros: Helps us do all of our engagement in one platform whereas we had multiple softwares before. Like the 'all in one' aspect of it. Good support team. Cons: Many issues and lack of simple necessary functions. Email formatting issues, preview issues, viewer interface sorting issues, cumbersome editing, social media publishing is cumbersome. Overall, found many aggravating issues. Hi Jacqueline - We are concerned about your review because this is the opposite of what we're hearing from our other Engage users. We will have our Smart Start strategist Ilona reach out to you immediately to see if we can help you get more comfortable with the tools. Pros: It was not as expensive as some of the other professional suites. Cons: This is the most non intuitive program i have ever used. It can do what you need but it is not going to be easy to get there and will take days if you have to go back and forth with the help center. They don't appear to be super compatible with safari. They open helpful windows and the close function will be off screen. Nothing is more frustrating then trying to get something done and have a pop obscure your window and you can't close it. I stopped to write this review because thats where I am and it has happened more then once this year. The help documents on-line frequently do not match the program or the information is obtuse. They will give an instruction but not how to reach the page where the function is buried and the screen shot will look nothing like the current program. Do you assume its outdated or spend an hour looking for the secret portal...It will not be where you logically thing it should be. There query system for generating and outputting mailing lists is cumbersome and takes several steps to achieve what seems like a simple task. If you need to know who was added to your database this year you have to select several pulldowns before you can select the date. If you output the wrong way it will delete the first digit of any zip code that starts with zero. The design engine for email blasts is clunky and leaves too much space between elements that can't be adjusted. It makes for some awkward spacing and alignment. Overall: We have been using it for two years and have done several events and countless email blasts and the learning curve is still way too steep. We frequently have requests for simple things like linking directly to the ticket sales page and we have to wait a year for implementation because the process is in a widget. We will be switching to something more user friendly. Pros: Salsa has provided great customer service -- whenever we have an issue, their tech support team gets on it ASAP and usually has everything resolved pretty quickly. Cons: The system can be a little difficult to use in certain ways -- for instance, building donation pages can be buggy at times, as selecting social media functions causes the page you're working on to close, or when you're randomly forced to sign out and sign back in again because certain functions are no longer working in a single session (i.e. if you want to create two or more donation pages in a row, you need to log out and log back in before you build each new page or you won't be able to select the right template for the pages). These aren't MAJOR issues, but they are annoying when you're trying to bang out a lot of work. Another thing is that the STOREFRONT feature is sorely underdeveloped and could use a lot of work and additional functionality, such as the ability to calculate sales tax, built-in social media functionality, more dynamic product options (like the ability to charge different prices for different versions of the same store item, or the ability to select multiple product types on a single storefront item). You would need to get outside developers to build these features for you, if you really need them. Recommendations to other buyers: Salsa is best used for donations. If you have a large store and you're selling products, it probably wouldn't be the right software for your needs, given how limited the storefront functionality is. Comments: Tough to choose among the many products out there, but Salsa was one of just a few that stood out above the rest for our needs. On my first pass I didn't include them in my top 5 down select, mainly because I thought having separate CRM and Engage products would be problematic. However Software Advice recommended taking a look, and when we did they ended up edging the competition. I spoke to a reference customer who said that the two products work well together, and was especially impressed with the progress the Salsa team has made in improving the products over the last year. Pros: Customer service and attentiveness have been great. Much more personal than some of the other big name products, where I felt like we were a number in their sales pipeline. Like the kick start process that Salsa has in place. Cons: None yet. We've just started to use it. Separate CRM and Engage products are not ideal, but they pull it off well. Skill Labs learning videos are really good, though it can be annoying that they force you to go in a certain order for some modules. Great drag and drop system! Pros: Love the easy marketing platform engage has built with the ability to craft visually dynamic emails and all of our event/fundraising pages! Cons: The company does quite a few updates, which is great, however, sometimes these cause a bug in the system and it will interfere with functionality temporarily. Overall: We can combine all of our external communications including event pages, donation pages, and email marketing into one platform! Pros: Salsa Engage really seems to do it all. We use it as our grassroots advocacy platform and are able to track interactions from our campaign. This allows us to collect tangible data about how many people called, emailed, or mailed their representatives. Salsa Engage has also replaced our giving pages, Eventbrite, and MailChimp. It's been so great to have one platform for all our communications and be able to track and connect everything. When things get complicated, customer support is usually a 10-minute hold and are able to walk me through it. Cons: Setting up Salsa Engage and CRM took FOREVER! I didn't have a whole lot of time set aside to set it up, but even if I had, I expect it took at least 20 hours. Now that it's set up and I've completed the online training, I still find hidden issues with just about everything it does. The good news is customer support is always able to explain exactly what I need to do to fix it. I know eventually, I'll have worked through all the issues and will just know better. Overall: Our nonprofit uses Salsa Engage for grassroots advocacy, fundraising, communications, and event planning. Being able to combine four different services into one integrative platform has saved the organization countless hours and effort. Great all inclusive product, attentive and helpful customer service. Pros: I like that a variety of our needs are met by one sleek product. Not only is this convenient, not only does it centrally store our supporter data, it also provides invaluable context about that data, that would otherwise be very difficult to see. The ability to see these connections and trends is vital to the success of our campaigns. Cons: The price is difficult to justify for a small non-profit. Recommendations to other buyers: The true power of Salsa doesn't reveal itself until you dump a decent amount of data into it. Give it time and commit to having staff engage with it often. It sells itself. There is nothing that quite meets all of the needs of a nonprofit that we have found. Mostly happy, but with some concerns. Pros: As a full service product Salsa is an easier to use alternative to Salesforce (I used Salesforce for several years). Cons: The administrative area is very hard on the eyes, sometimes buggy and poorly designed. The templating feature is draconian and lacks modern features like drag and drop. I encourage Salsa staff to sign up for a Mail Chimp demo and looks at how easy it is to create templates, on the fly, with no need to manipulate or import code. This applies to the donation page templates as well. Also, there aren't enough built in reports and building reports requires a degree in Salsa. It would be good if Salsa integrated with a greater number of merchants. Recommendations to other buyers: Your choices are limited if you are looking for a full package service - Salsa does the trick but it requires patience and commitment. Comments: Salsa has lots of features that save loads of time for a hard-pressed or over-extended nonprofit staff. Especially if you're relying mostly on volunteers. It helps keep track of donors -- how much and when they give. You can set up a cause-campaign where you enable supporters to write letters to congressmen and other people in power. And it also easily collects and organizes information about donors and signups anytime someone enters their information. 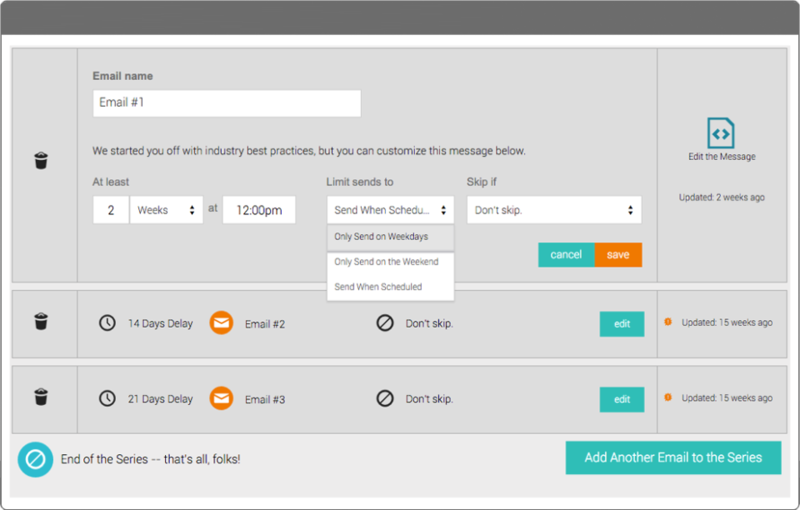 It can be set up to send out auto-responder emails any time someone gives or signs up. All this means you don't have to devote precious staff time to these tasks, once the Salsa system is in place. In addition, the customer support staff is highly responsive and works with you until things are working right. The only thing to be aware of is that a knowledge of html helps. If no one on your team has this knowledge, there are some features that will be harder to customize. There is a bit of a learning curve up front (anticipate spending a couple months getting things set up). Once it's "humming" along, it allows you to focus on other tasks -- the ones you'd rather be doing. Pros: It has some good features like custom donation pages that you can design as you want. Cons: The CRM is uninspired, difficult to learn and use, run of the mill. Overall: You need to dedicate a person in your org to run this. Customer service will help you, but it's up to you to make it happen. Pros: The ability to create form letters and send them via email was much needed for our organization. Customer service is very helpful. Cons: Salsa seems a little slow in adopting the latest features and some of the design elements could be more customizable. Pros: The ease of setting up and using advocacy actions, campaigns and petitions. Customer support has a very fast response, which is appreciated. The number of fields is great. Cons: WYS is NOT WYG. The editor is so hard to use that our staff refuses to use it. I would like to see more information easily exportable from a query, specifically state districts and ideally groups. I have found the custom report generator clumsy to use. Recommendations to other buyers: You will need someone who knows html to set up templates and to help occasionally. Comments: Pros: Great for integrating all parts of our advocacy and communications into a single platform. It's nice to know who took action on advocacy alerts, read emails, and attended events all in one place. 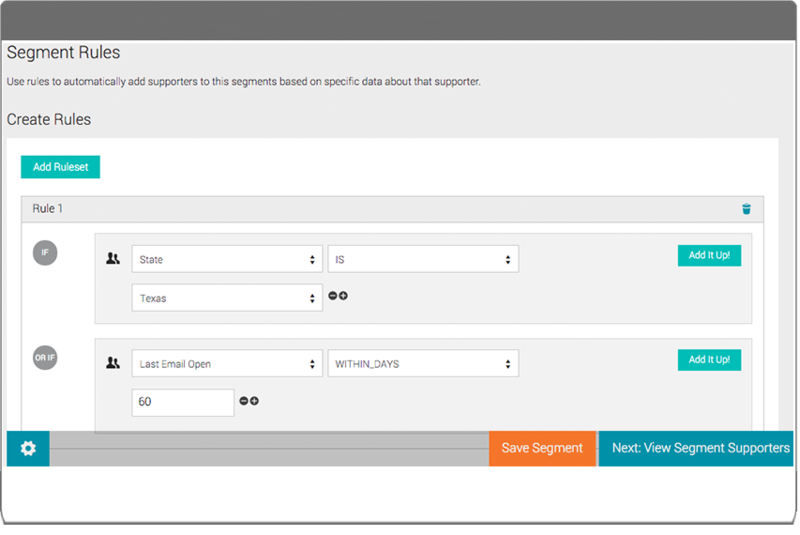 Scoring and smart groups are great for segmenting your supporter list. I love the new integration to pull in information from social media accounts (for free!) Salsa always rolls out improvements to their service that are not an extra charge. Cons: I personally don't like the graphical interface. I think it could use a facelift to match modern design concepts. There are many features available that are free to use, but you have to request to have activated. I haven't been able to find a list of these features, so I tend to find them while reading through the knowledge center. I'd love for everything that's available to be activated upon opening an account, rather than having to discover and request the features. Although there is a spot that tells you when the last update to a supporter record was made, you cannot find out what the update was or who it was made by. Some of the query tools are a little bit difficult to understand, for instance using greater than and less than with dates rather than before and after. Pros: When evaluating products, it looks like a nice one-stop-shop solution. But I am totally dissatisfied with this product. The vendor misrepresented the product, and it does not function well for most online donation functions and is extremely hard to use. Cons: 1) The pages are not mobile friendly at all. 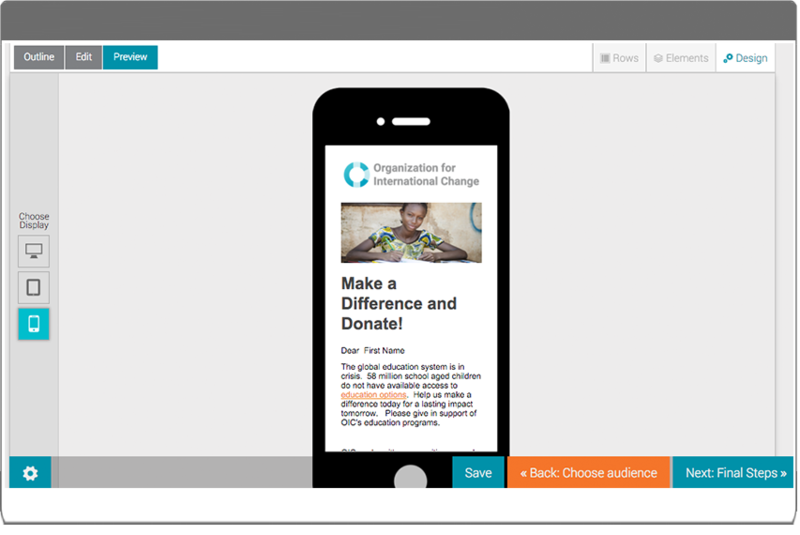 51% of donations come via mobile, and yet, the templates they provide are not adaptive to mobile. 2) Emails that you use through their system are not viewable in a browser. This is a huge issue if you want to forward your newsletter and fundraising emails. 3) Configuration and setup were a nightmare. It's not something that someone who isn't a high level it person could do. We spent tons of time and money getting it set up, and it still was barely useable even after all that effort. Recommendations to other buyers: Mobile friendly is crucial, and they downplay this in the sales process. Also, confirm that emails are viewable on the Web, and look at the back-end coding of templates and pages before you buy to be sure it makes sense to you. We converted from another CRM to Salsa in May 2017. We are very satisfied with the move. Pros: First let me say Customer Support is excellent. The team is always responsive in helping to solve problems. The software is easy to use and creating reports is very intuitive. We can easily produce mailing lists which was one of the main objectives in moving to Salsa. Cons: Creating email newsletters in Engage is not the easiest. We find we cannot format the material as easy as some other email vendors. One cannot easily size a photo to match the side text. It seems as if the text and column spaces are fixed in size. If you are willing to accept less visually attractive end produce the system is fine. We are considering moving to another email vendor for sending Newsletters. Overall: Accurate data and ease of creating reports. Pros: Staff is quick to respond and thoroughly explain any issues, whether they are technical or user errors. We like having everything in one place, from event coordination, to email blasts, donations, etc. Cons: It's a little more technical to use than other products. Recommendations to other buyers: Ask yourself what you are looking to do and make sure when comparing products that doesn't add costs to some of the other products out there. Can you create multiple templates? Does it track supporter information? Pros: Very powerful way to get out our advocacy alerts. I can easily target my audience with a specific amount of information (not too little, not too much). Cons: Not so easy to use. I'd like to take advantage of more options but just don't have the time to learn what I need to learn. Recommendations to other buyers: Make sure that the software has good features like the "Tell a Friend" page, etc. Also, be sure you can easily target your audience and use groups. 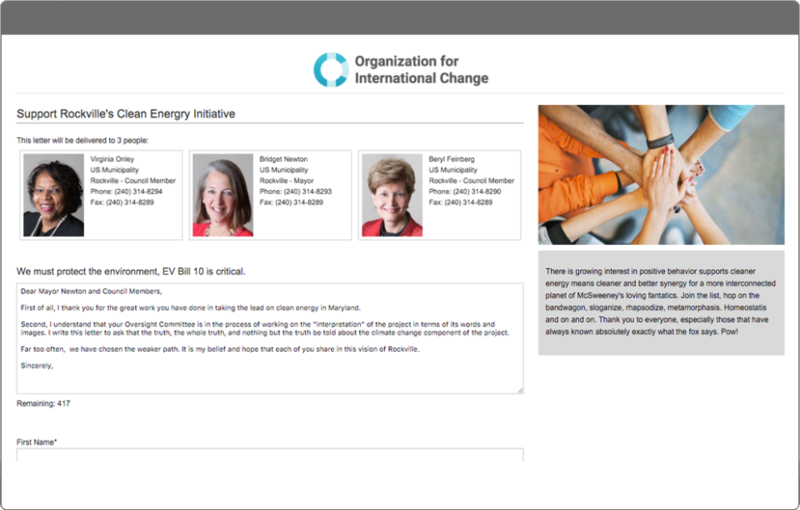 Pros: It is easy to access and has so many different ways of plugging in our network to advocacy or fundraising. Cons: Nothing that I can think of. I really enjoy using the program and feel that I would recommend it to others. I have recommended to others! Recommendations to other buyers: Evaluate it based on it's capabilities and the amount of people it can engage in the organizations efforts. Pros: This product is very easy to use. 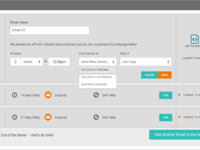 Sending mass emails, creating and managing groups. Salsa is good at responding and following up fast to clients requests for support of any kind. Cons: The queries get a little complicated, but not impossible. Recommendations to other buyers: I do not have any recommendation at this time. I think their experience and mine are different. Pros: User friendly, easy to navigate, fairly easy to search, useful records such as donor files, etc. Like the groups and tags to be able to categorize our supporters. Recommendations to other buyers: Think about what you use it for and what you would like to be able to do in the future. I have used this software for campaigns in the past. Pros: I like the friendly and welcoming look of the appeals I have received. The layout and ease of use are great. Cons: I feel like it is not as advanced as other software products with similar features. I think they could modernize and be more user friendly. Pros: It integrates our email, online donation, and advocacy needs in the same product. Cons: Some of the email formatting is difficult. And my biggest pet peeve right now is that Salsa opens a new tab in my browser every time I want to sign in to Cosm. If you could just let it open in the same tab, that would be SO appreciated. Literally the only reason I am answering this survey. Recommendations to other buyers: Do you need your CRM email, donation, advocacy, and supporter management all in one place? Pros: Gets the job done! We send out monthly e-mails and it works, everytime. Cons: Missing the old founders. Wishing the product had more integration with email templates and an updated user interface. Recommendations to other buyers: We recommend doing a price comparison with other leading email services--this one works for us. Pros: There aren't many products out there created specifically for advocacy-based organizations, but this is one of them. Cons: It's in all-in-one package which is nice but it can be difficult to use, doesn't interface with Salesforce or other programs well, and some of the contact information for legislators is out of date (which is probably the most frustrating part). Pros: Reaching advocates via email is easy and the tracking tools are very helpful. Cons: The donor database side of Salsa is not as robust as we'd like, but is mostly adequate. Recommendations to other buyers: If you have the funds for a separate donor or major donor database, you may want to consider that option. Pros: Salsa is an all in one tool for Arts Alliance Illinois (AAI) and has tremendously streamlined our communications. As an advocacy organization we were limited in our options for an all in one CRM. Cons: Moving from multiple specified tools into an all in one, we did loose some details and specificity that a tool designed specifically for 1 purpose serves. Recommendations to other buyers: It is a great tool, and the customer service is excellent. Pros: I like tracking emails feature, being able to tell if key constituents have opened your email or not. Recommendations to other buyers: More work needs to be done on tracking fiscal functions/donations. Pros: I enjoy the multi-functionality of the tool, i.e. tracks list, engagement, fundraising, all kinds of on and off-line actions, and there's great user support. Cons: It is not the best for tracking volunteer relationships/engagement. Recommendations to other buyers: Think first about what it is you need to do to meet your goals then build/analyze software based on this purpose (instead of the other way around). Pros: The multifaceted approach to communications + donor tracking system. Cons: The donation reports are difficult to pull, and hard to create. I have to pull them out and put them in Excel to make them functional. Recommendations to other buyers: What is the main purpose of using this software? If it's for communications tracking, then it's a perfect fit. We still struggle with the donor tracking as a solid CRM database. Good for how much it costs. Pros: Ease of use and export of information. I like both of these things about it. Cons: Lack of customization. I do not like the lack of customization. Recommendations to other buyers: Ask people you know and trust which software they use. Pros: The product helps to connect multiple facets of a non-profit's online activities under a single umbrella. Cons: Sometimes the product can be complicated to use, however the Salsa team is always ready to help when issues arise. Recommendations to other buyers: Imagine your digital needs for the next 5 years and ask if this software does what you imagine you'll need done. For us the answer was yes. Pros: Not only is this an effective tool for outreach and data management, but the support you get is amazing! Cons: Sometimes some of the reports can be a challenge to create. Recommendations to other buyers: Make sure you are getting the best support possible...Salsa may not be the most inexpensive option, but I can tell you that when I am having issues, it sure is great to have such great folks to help me out! Overall: We used Salsa for a number of years. We really appreciated the large number of tools under one roof. Also supporting an up and coming tech company located here in DC was an added bonus. However, a couple of recurring problems forced us to switch to Neon CRM and One Click Politics. First, the interface for creating emails and webpages is glitchy and inconsistent. Unless you know HTML, the user tools they provide are inconsistent in their quality. They do not do what you expect. One particularly troublesome piece was simply adding a url link to an image for folks to click on. Either the picture would be there with no link, or the link with no picture. About every 10th time you tried it would work as it was supposed to. But very frustrating when you are rushing to get an email out or setup up a time sensitive advocacy action. The second and bigger problem is Salsa has a bad reputation with spam houses. 50-75% of our listserv messages would get caught in folks spam filters because of its low reputation. I don't even want to imagine how many of our fundraising emails went into spam folder. There are many powerful things within Salsa, but it lacks consistency and reliability to make the broad range of tools available worth the aggravation of too many glitches in quality. Pros: The ease of use and customer service during and post onboarding has been a dream! As a small non-profit we have been able to streamline and focus on growth with the ease of operations! Cons: none - with constant updates to the software there are always improvements underway! Overall: LOVE it!! I have incurred a few hiccups here and their - they are generally user error and the Salsa team is quick and kind to help us resolve! Comments: Really glad we switched! Perfect for our non-profit organization. Pros: We have loved the functionality and ease of use of this software. We first tried a competitor and are grateful we made the switch. Once implemented it has been a great time saver. Cons: There is always a learning curve, as this software has one as well, but the support staff is excellent and helps you through without nickle and diming you to death. Cons: It's not worth it... There are so many problems with both the software and the service. The software is completely unintuitive. Nothing makes logical sense. It seems to have been designed by field organizers for political campaigns, not by customer friendly coders in the IT world. The service is hardly better. It's very difficult to get a live person on the phone. It's easy to get someone via email, but then it takes a back & forth of 4-5 emails before they get to the question you want answered (the first answers are usually "have you read the online help manual?" or "can you send me a screenshot of what you're talking about? ", and half the time the final answer is they can't solve the problem you have. Within just one month we started running repeatedly into limitations of what the software can do. And we're a very small non-profit that's hardly sophisticated. Recommendations to other buyers: Stay away from Salsa! But if you have to use it, budget in money for in-house IT support to use it and prepare yourself for dozens of hours to train that person to use their completely arcane system. Also beware of the bait and switch. We were promised all kinds of support in using it but once we started running into problems (right away) we were told we'd have to pay each month to get dedicated support access. Better to pay your own person less and have their loyalties be to you. Pros: Automatization and centralization. Your website, donations and newsletters are all in the same place. The personal service from Salsa is truly excellent. Cons: Limited customization. Not well suited to integrating with other software. Recommendations to other buyers: If you are an organization with a relatively small number of donors this is for you. It is well suited for people with limited computer skills. If you have big software programming ideas there are options but Salsa is perhaps not the best. Pros: Frequent updates and responsiveness to user requests. Very user-friendly. Easy to set up action pages in particular. Cons: Could have stronger membership features, and better ways to limit access for certain users. Overall: We upgraded from Salsa Classic to Salsa Engage and are happy with the added features, layout, and user-friendliness (both on our end and for our members).